Carte de la Navigation des Argonautes du monde Primitif suivant les periples de Timee, d'Hecatee, d'Apollonius et d'Onomacrite Pour servir a l'Histoire de la Greece. 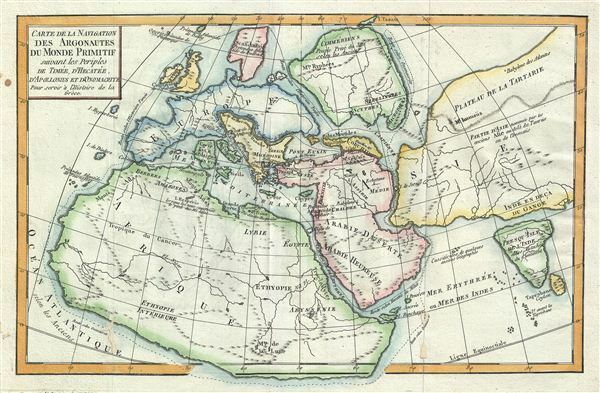 This is a fascinating example of Jean-Baptiste-Claude Delisle de Sales' map 1770 of the Ancient World. Is as much as it was understood by ancient Greek Geographicus, Delisle de Sales' map depicts the entire world and follows the journeys of the historians and philosophers Timaeus, Hecataeus, Apollonius and Onomacritus. While Africa, Western Europe, and Arabia are recognizable, what are today Russia, Asia, and the Indian subcontinent are separated from one another by wide oceanic channels. Western exploration had yet to reach Asia's northeast coast and consequently a conjectural rounded coastline is shown. Scythia is depicted as a separate continent in itself, while central Italy, identified by its Greek name Thyrrenia, is a separate island. The Island of Nova Zembla or Novaya Zemlya is here identified as Island Tazata (or Tasata, its primitive name, from the River Taas). In Africa. the Mountains of the Moon as well as the speculative lakes at the source of the Nile River are identified. Sri Lanka or Ceylon is identified by its Roman name, Tapobrana. Several ancient cities and towns are named, including Ecbatane, Babylon, Berenice, and others. This map was issued as part of Delisle de Sales' Histoire des hommes. Partie de l'Histoire Ancienne. Becasue most of Sales' work was burnt under the censorship of heresy, this volume is exceedingly rare. Very good. Blank on verso. Minor wear along original foldlines. Minor damage and verso repair near lower left quadrant.